Last week, the Microsoft Ignite event was hosted in Orlando. As with every Microsoft Event, a lot of new stuff is released by the Microsoft product teams. The same goes for the IoT Edge runtime, the portal and the logic running on IoT Edge. The IoT Edge runtime bumped up to version 1.0.2 and there are lots of new features introduced like extended offline operation and proxy support. But the documentation considering the update of your gateways is a bit limited. If I follow the update procedure, I have to update it on the machine itself. Let’s check out how we update our runtime remotely. Update: Microsoft released this document with more details after I wrote this blog. Some parts could be out-dated by now. [Update 15-01-2018]: The issue is being fixed asap. I have been notified the dialogs of Azure Stream Analytics will be changed in a couple of days. This blog will remain valid, though. [Update 13-01-2018]: It seems the IoTEdge-ASA integration is suddenly not available in the Azure Portal. Eg. the Environment Host question shown below is dropped and no Edge Hub input or output is selectable anymore. No idea why… When more information is available, a new update will be posted here. 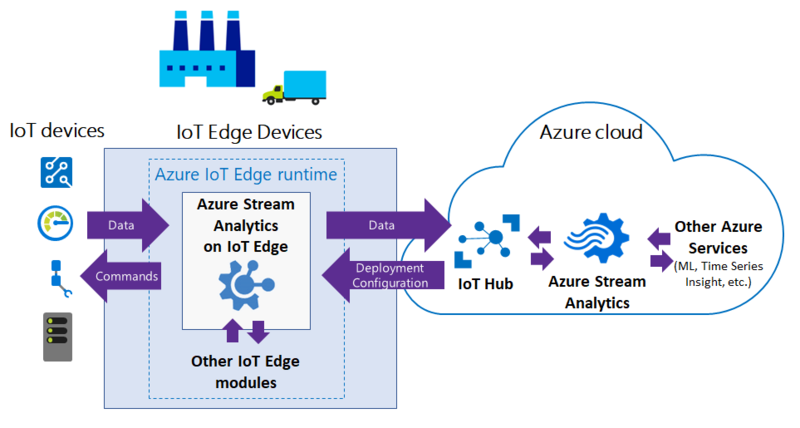 The second version of the Microsoft IoTEdge solution is now available as Public Preview. In this version, you can run predefined modules like Modbus, build your own modules, deploy Azure Machine Learning modules, deploy Azure Functions and you can deploy Azure StreamAnalytics jobs.